Posted March 2, 2008 in Articles and Quetico Park People. In the spring of 1942, sixteen-year-old Bob Hayes landed at the Bayley Bay Ranger station on Basswood Lake. Years later, he remembers thinking that “I thought I was descending into the ultimate paradise.” Since he was coming from Beaverhouse Lake, where he had worked on a walleye spawning crew, he already knew that working and living in Quetico Park was a perfect fit for a young man interested in the outdoors. He had become quickly infatuated with Quetico, and he soon found out that across the lake was an attraction that proved to be even stronger than Quetico. 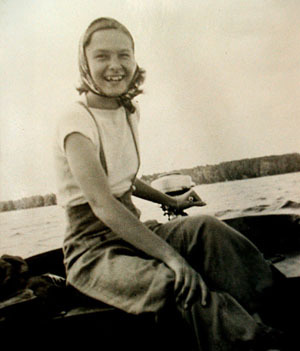 Leone Johnson, who was also sixteen in 1942, spent her summers working at Johnson Brother’s Fishing Camp, which was owned and built by her father Oscar Johnson and his brother Bill. It was located west of Rice Bay on the American side of the lake almost directly south of the Bayley Bay Ranger Station. Leone’s family has a long history on Basswood Lake. Her father, Oscar Johnson, fished commercially on Pipestone Bay in the 1920’s and he started Johnson Brother’s Fishing Camp with his brother Bill in 1925. The camp, the second one on Basswood Lake, was composed of a main lodge and five cabins. It appealed to serious fishermen and its reputation spread quickly by word of mouth and they never had to advertise. The fishing camp was a family business and Leone worked long hours and had a variety of jobs. Oscar and Bill ran the resort until they sold to the government in 1953 when Basswood resorts were being bought out to create the Boundary Waters Canoe Area Wilderness. Although Bob’s days were busy with his duties as a Park Ranger, he commonly had time in the evenings to pursue his own interests. Bob was fortunate that both the supervisors he had at Bayley Bay, George Armstrong and Oscar Frederickson, took a liking to him and were willing to assist him in any way they could. For example, on Bob’s first evening on Basswood Lake, George Armstrong took him across Bayley Bay to meet the young women who worked at Johnson Brothers Fishing Camp. Bob went back to work on the spawning crew at Beaverhouse Lake in the spring of 1943, but this time he was in charge of the operation. He was just seventeen years old and to make his job more challenging, his twenty-one year old brother was a member of the crew. He went to Pickerel Lake for the first part of the summer where he patrolled for poachers with George Armstrong. 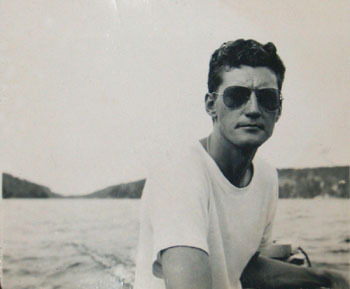 Bob had corresponded with Leone over the winter and he was extremely happy to end up back on Basswood Lake for the remainder of the summer. There were many twenty-minute paddles or five-minute boat rides across Bayley Bay during the summers of 1942 and 1943. Bob spent the fall at Cabin 16 on Basswood Lake where he shared the Park Ranger duties with Jess Valley, an experienced Park Ranger. He was able to visit Leone on weekends, traveling by canoe in the fall and by snowshoe in the winter. In the fall of 1943, World War II was becoming very intense and Bob felt a strong obligation to do his part. Since he was not yet eighteen, he had to get written permission from his parents to join the military. He enlisted in the Royal Canadian Air Force in January of 1944 and quickly came to the realization that he might not survive the war. Since he was unsure of his fate and didn’t want Leone to wait, possibly in vain, for his return, he reluctantly wrote her a ‘Dear Jane’ letter. After his military training, he was sent to England where he served as a flight engineer on a Lancaster Bomber on bombing missions over Germany. He was discharged in the spring of 1946 and quickly discovered that Leone had taken his letter seriously and had married and had a baby. Bob was anxious about returning to Quetico Park but, for obvious reasons, he had no desire to go back to Basswood Lake. He spent the summer working at Lac La Croix but was assigned to work with Jess Valley again at Cabin 16 on Basswood Lake in the fall. He agreed to go since he knew Jess and enjoyed working with him. When the plane landed on Basswood Lake, Bob learned that Leone’s husband, who was only 26 years old, had just died from congestive heart failure. Bob went to see Leone that fall and they both looked forward to seeing more of each other the next summer on Basswood Lake. 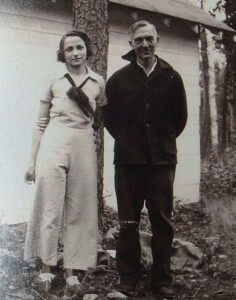 In the spring of 1947, Leone was back working at her parents’ resort near Rice Bay on Basswood Lake and Bob was glad to be back on Bayley Bay working for Oscar Frederickson. Bob describes Oscar as one of the most unforgettable people that he has ever met. He was a man with “a gruff exterior, but a heart of gold.” During the summer, park authorities decided to transfer Bob to Lac La Croix. Oscar Frederickson, however, had other ideas. Bob recalls that Oscar radioed park headquarters, although the plane was already in the air, and growled, “I want Hayes to stay here and here he’s going to stay.” Oscar was highly respected by park officials and his opinion carried a lot of weight. The plane landed, but flew back without Bob. Bob and Leone saw a lot of each other during the rest of the summer and, to no one’s surprise, decided to get married. Bob quit the Ontario Department of Lands and Forests (the precursor of the Ontario Ministry of Natural Resources) in January of 1948 and married Leone in May of 1948. They moved to Emo, Ontario where Bob worked as a heavy equipment operator for the Department of Highways. They had a daughter, Suzie, two years later. They were content living in Emo, but they both missed northern Minnesota with its proximity to Basswood Lake and felt they would be happier in Winton. Bob contacted the U. S. Consulate in Winnipeg and had his visa in just six weeks. They moved to Winton and Bob was quickly hired to work at the Winton Hydro Electric dam on Fall Lake. He worked there for 31 years and retired in 1985 at the age of 59. Bob was born in 1926 and grew up on the Manitou Rapids Reserve, which is located on the north shore of the Rainy River west of Fort Francis, Ontario. His father was the agricultural agent of the Reserve and he was the first white baby born on the Reserve which is now part of the Rainy River First Nation. The Manitou Mounds, situated along the shore of the Rainy River, are the largest group of burial mounds in Canada. This site, known in Ojibwa as Kay-Nah-Chi-Wah-Nung, or “place of the long rapids”, was declared a site of national historic significance in 1970. It is now the home of a terrific Interpretive Centre that presents local history from a First Nations point of view. Bob and his two brothers had an idyllic childhood growing up along the Rainy River. It must have been similar to my childhood in southern Minnesota except he was fishing for walleyes instead of bullheads and playing “cowboys and Indians” with real Indians. Leone was born in Ely, Minnesota and lived in Winton until her family moved back to Ely when she was in the sixth grade. She had a typical northern Minnesota childhood except she spent her summers working at her parents resort on Basswood Lake. She started when she was very young and her responsibilities increased as she got older. She cleaned cabins, worked in the kitchen, cut firewood with a cross cut saw, cleaned outhouses, put up ice, and pumped water up to the tank. A small generator powered the resort and it was turned off, and the lights went out, at 10 p.m.
She also had opportunities to get out onto the lake. The resort had launches and, on occasion, she was able to ride on trips to pick up or drop off guests at Four Mile Portage or even take excursions into the Canadian side of the lake to drop canoeists off at the beginning of their trips. Each morning, Leone used to take a boat to Leo Chosa’s store at Prairie Portage to get minnows. Her friends from Ely and Winton also came up to visit. Of course, she also got time off to take part in those pleasant activities, such as fishing and swimming, that go with living on the lake. The Basswood Lake that Bob landed on in 1942 was a very different place from what it is today. The attributes of good fishing, abundant wildlife and berries attracted Native People to Basswood Lake and there is archaeological evidence for at least 9,000 years of use of the lake. These same attributes also attracted tourists to the area. A 45 lb 9 oz Northern Pike was caught on Basswood Lake in 1929 and this remains the Minnesota state record. There is good northern pike, smallmouth bass and walleye fishing virtually everywhere on Basswood and lake trout thrive in the cold, clear deep waters of most of the Canadian side of the lake, with Bayley Bay and North Bay being especially renown trout waters. The shallow water sections, located primarily in the southern part of the lake, are home to bluegills and crappies. The attraction of Basswood Lake, undoubtedly one of the most productive and diverse lakes in the entire Boundary Waters region, continues to this day. The lake was a busy tourist area and there were twenty resorts operating on Basswood Lake in 1942. Some were small resorts that catered to families and provided opportunities for fishing, canoeing, swimming and relaxation, while others primarily catered to fisherman. A few, such as Basswood Lodge, were family resorts that featured luxurious dining on gourmet foods in addition to hot showers and flush toilets. During the day, guests were fishing on the lake, primarily in motorboats, or remained at the resorts to swim or simply relax. In addition to the resorts, houseboats were also present on the lake. Although the lake was busy during the day, people returned to the lodges for the night and campsites were used less than they are now. Although motorboats were more common on the lake than canoes during the resort years on Basswood, people were also or using canoes at the resorts and going on canoe trips. Although most people and supplies got to Basswood Lake via the motorized Four Mile Portage, some arrived by air. Ely was the hub for float planes flying to resorts in the area as well as flying fishermen and canoeists to their destinations. Ely was the largest inland seaplane base in North America in 1946. In 1949, height restrictions for flying over the BWCAW were put in place. The restrictions on flying, and other restrictions, led to a demise of the resorts. This was a period of intense debate, acrimonious charges and numerous court battles between those favoring motor use and wilderness advocates. Many decades have passed, the debates continue and the wounds have still not completely healed. In contrast to today, logging was occurring on Basswood in the 1940’s. Logging was being carried out on the Canadian side of Basswood Lake, with newly initiated 300 foot shoreline restrictions, in 1942 and 1943. J. M. Matheiu had two logging camps on Basswood Lake, one on Sunday Bay and another on Canadian Point. Logging on the American side of Basswood began in 1895. Accessible lumber declined in the early 1920’s and the two large mills in Winton, Minnesota that were the destination for much of the lumber, Swallow and Hopkins and St. Croix, closed in 1922 and 1923. Logging continued near Basswood Lake at a slower pace in the 1930’s. Frank Hubachek bought land on shore of Basswood when he heard that large pines along the shore were scheduled for logging in 1937. This became the site of the Basswood Wilderness Research station. Bob guided for twenty-one years and for fourteen years he was head guide for the Trail Riders, a group associated with the American Forestry Association. He did all his guiding in Quetico Park. On his trips, the emphasis was on traveling and seeing as much of Quetico Park as possible. Fishing was an important part of the trip, but they fished mainly for food. They would stop when they had enough for a meal of fresh fish. Bob told his clients that he wasn’t mad at the fish and they wouldn’t keep catching fish they didn’t need. Conversing around the campfire was an important part of the trip. Bob is a good storyteller with lots of canoeing and camping experiences to relate. When a young guide asked him for advice on guiding, Bob told him, somewhat in jest, to “take lots of whiskey”. In the spirit of Bill Magie, Bob Cary, Sigurd Olson and other north woods guides, many stories were told around the campfire. I’m sure that many people ended their trips with Bob with stories, not only of their own exploits, but also tales that they heard from Bob Hayes. His favourite starting point for a trip was Powell Lake. They would fly to Powell Lake and come down Clay Creek, now called Greenwood Creek, and the Wawiag River to Kawnipi Lake. Lower water levels and warmer temperatures in recent years have made Greenwood Creek paddleable only in the spring. From Kawa Bay of Kawnipi there are numerous routes to take back to Moose Lake or Fall Lake. Some of his other favourite spots in Quetico are McEwen, McIntyre and Robinson Lakes. Bob would pick a route that best suited his clients’ interests and experience. They live in Winton, Minnesota, just a short distance from where they met on Basswood Lake. They have often returned to camp on Basswood Lake – first by themselves, then with children and finally with grandchildren. They have remained active and when Leone’s daughter and daughter-in-law go for walks with Leone they both mention that have a hard time keeping up to her. Bob has had knee surgery, or he, also, would also be hard to keep up with. Leone is also known throughout Winton for taking her homemade soup to people who aren’t feeling well. 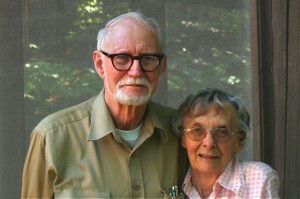 Bob says that he “left the employ of the Ontario Department of Lands and Forests to marry a woman I couldn’t live without – I still can’t.” The pair that Shan Walshe called ” the nicest couple I know” are thriving in their home not far from where they met on Basswood Lake. I have recently been in touch with Bob, as he and I come from the same “family tree”, although his branch had been kind of lost. While living here in Kenora, I delved harder into this branch, and have found a treasure trove of relatives, with Bob being a shining star. So pleased to read your article here. THanks for the research and the care with which this was written. I am a member of the Rainy River First Nations (Manitou Rapids) and i work at the Kay-Nah-Chi-Wah-Nung Historical Center. 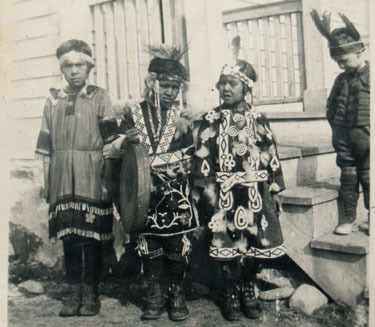 I happened to be doing some research on our site one day and the photo of the three little children in their traditional dress as well as the little white boy caught my eye. After clicking on the photo i was very intrigued to discover the photo was taken in Manitou Rapids and the story of Bob and Leone was of great interest to me. I managed to speak to Bob after contacting him by telephone which was like stepping back in time for me because Bob was kind enough to share some valuable information about the history of my community. My wife Melonee and i are excited to meet Bob and Leone as we were invited to visit with them at their home in Winton. Miigwech Bob and Leone. We were introduced to Bob and Leone through our father Stan in the ’60s and have maintained a connection to them through three generations. During college, I worked with Bob at the Winton Hydro Station and tried to absorb some of his wit and wisdom during his shifts. Brother Andy especially connected with Bob, helped them as they aged and regularly socialized with them in their home. The next generation connected with them, too. Our eldest son Caleb worked at Packsack in Winton during the summers and often visited with Leone when she stopped by on her walks. We have such fond memories of Bob and Leone. They are significant people in our lives. It is sad to hear of Bob’s passing and we have abiding concern for Leone. He was truly his own man in all things and their love endures the many years.